The latest high efficiency gas fire incorporating our latest technology creating a superb large fire with a fantastic realistic fuel bed with owing leaping flames to give real visual impact. Lower running costs, high efficiency, and heat outputs up to an amazing 5.1kw combined with visual realism making this fire a wonderful focal point, a heating appliance that not only looks great but offers superb efficiency. All of the Newmans high efficiency gas fires have hand held remote control with a choice of cream or black fire chambers, a reflective smoked glass chamber is available as an optional extra to enhance even further the fuel bed with leaping flames, simply magical. Optional non reflective facia glass available making the glass frontage nearly invisible. 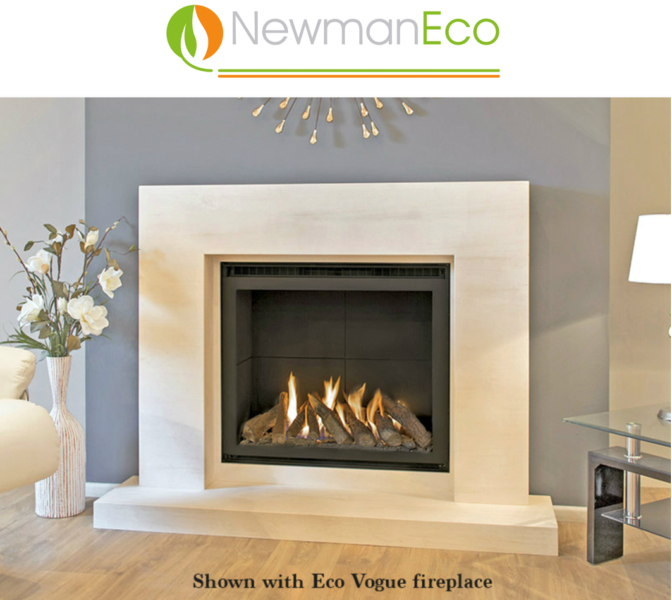 The Vogue natural Portuguese limestone fireplace has been specifically designed to accommodate the Newman Eco Ultra Vision high efficiency gas fire, clean lines and contemporary styling are at the forefront of the stylish design, Designed to accommodate the Eco Newman Ultra Vision high efficiency gas fire with stunning results.